SKU: PUB-AS6202T-1. Categories: N.A.S., Asustor, Home to Power User. Tags: AS6302T, Nas Asustor AS6302T. 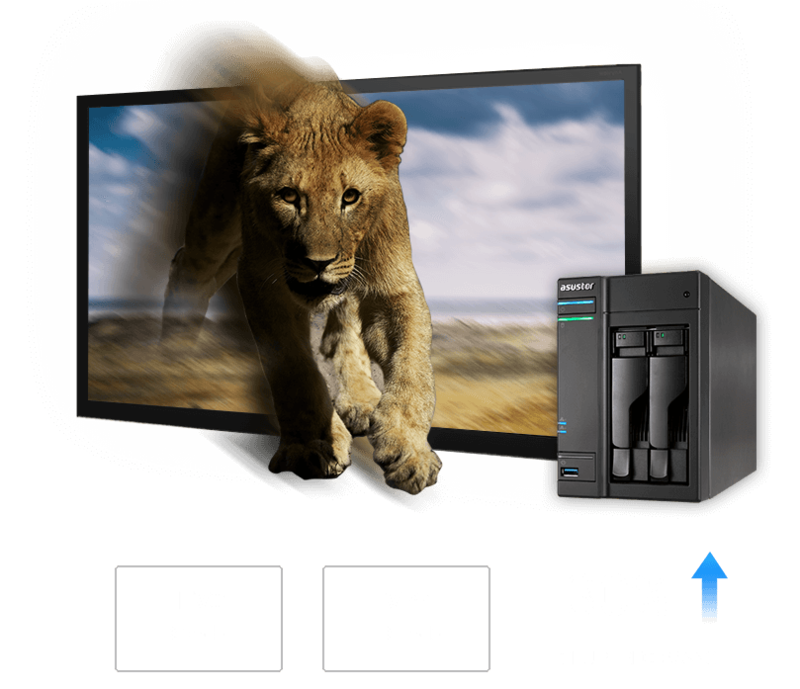 A comprehensive 2 bay NAS equipped with an Intel Celeron (Apollo Lake) dual-core processor for powerful 4K output. Economical and perfect for both home and personal use. The all new AS6302T is equipped with the Intel Celeron (Apollo Lake) sixth generation 14nm process built dual-core processor. It features overclocking to 2.5GHz and overall performance that is enhanced by 30% when compared with previous generations, satisfying the needs for 24/7 access in small business environments. 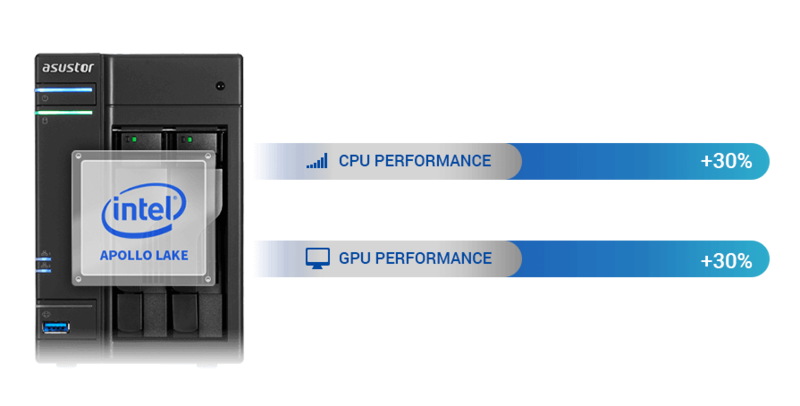 The AS6302T features a built-in Intel HD graphics engine, supporting HEVC and VP9 hardware transcoding that significantly enhances multimedia and image processing performance by 30%. This provides an unparalleled fluid usage experience for professionals and prosumers alike. The AS6302T comes built-in with 2GB of dual-channel DDR3L SO-DIMM memory, allowing for remarkably fluid 4K playback. Furthermore, support for mixed capacity memory expansion, enhances configuration flexibility. 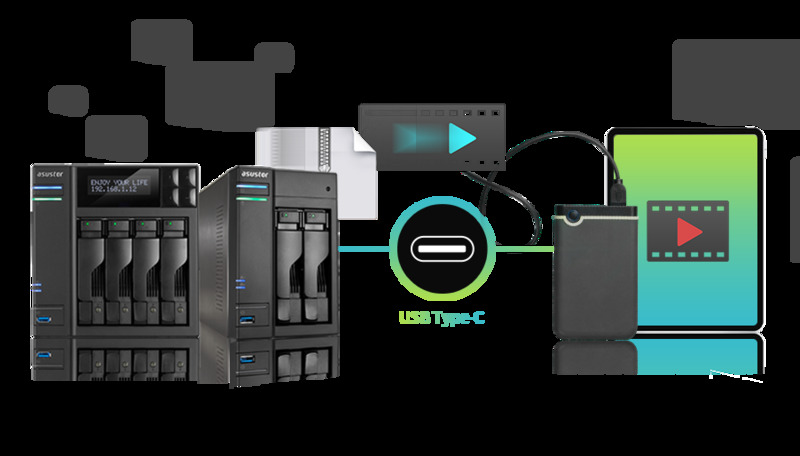 In addition to the existing USB 3.0 Type-A ports, the AS63/64 series devices have added two-way Type-C ports that allow your NAS to easily connect to a new generation of devices, quickly completing transfers of large multimedia files. 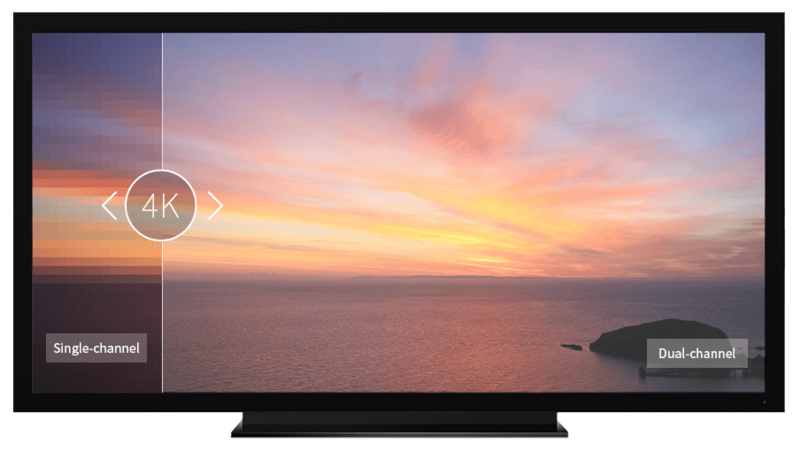 The AS63/64 series supports next generation HDMI 2.0 specifications, featuring up to 60/50P 4K resolution video which provides twice the fluidity of 4K 30P. Combined with built-in 2GB/8GB dual channel memory, this allows for the playback of 4K/UHD with unparalleled smoothness. No matter if it’s your treasured collection of Blu-ray quality movies or videos that you have recorded with professional quality cameras, ASUSTOR NAS can perfectly display all of it in crystal clear quality. *Please note that in order to play 4K/UHD 60P videos, you will need to use a HDMI 2.0 cable. 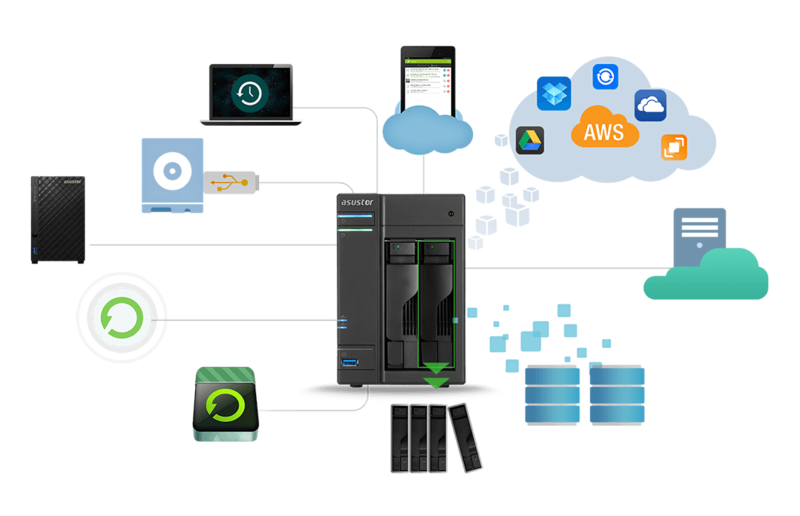 Want to access the data on your NAS at any time, but worried that leaving it powered on for a long period of time will result in costly power bills, wear and tear on your hard disks and NAS or that you will become the target of hackers? ASUSTOR has provided the AS63/64 series devices with two types of unique network wake (WOL/WOW) functions easing all of the doubts mentioned above! WOL (Wake on LAN) allows you to wake the NAS from sleep mode or when its powered off as long as you are in the same network. WOW (Wake on WAN) allows you to enable all NAS services via the Internet, providing added flexibility for powering on/off the NAS and data access. These two types of network wake functions allow you to save power, extend the life of your NAS and hard disks, and lower your chances of being randomly hacked, ensuring data security. All ASUSTOR NAS products are designed and developed around ecologically friendly concepts. 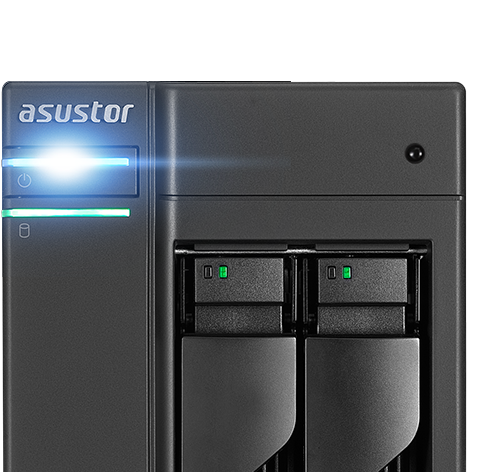 Not only do ASUSTOR NAS devices consume far less power than the average computer or server, but ASUSTOR’s power saving and management functions allows users to plan out a whole week’s power control schedule. Power scheduling can allow the NAS to power on, power off, sleep or perform other tasks at specified times of the day. This function can help to save a considerable amount of power while also prolonging the life of hard disks. Additionally, the new advanced WOW (Wake-On-WAN) function allows users to wake their NAS and access their files at any time. The AS6302T comes with the ADM operating system which is compatible with a large variety of network protocols*. No matter if you are using Windows, Mac OS X or Unix-like operating systems you will be still be able to easily access and share data on the NAS. No matter if you are using a PC, notebook, tablet or smartphone your data is always within reach. ASUSTOR NAS’s dedicated ADM operating system provides a simple operation interface and a variety of management tools for enterprise MIS staff. These tools include online hard disk capacity expansion, 3-step seamless system migration, event notifications, and comprehensive support for all 13 Windows ACL file permissions, allowing for close integration with AD domains and providing simplified IT management and increased productivity. ASUSTOR understands that your data is priceless, therefore ASUSTOR NAS provides different RAID Volume options, giving your data various levels of protection from the moment it is first stored on the NAS. We recommend you plan your storage protection based on your NAS model and number of hard disks. Data protection has never been so simple. The AS63 /64 provides over 12 different backup options and is connected to a variety of public cloud storage services including Amazon S3, ASUSWebStorage, Dropbox, Google Drive, OneDrive, Box.net, HiDrive, Ralus, WonderBox, xCloud and CrashPlan. You can also use FTP Explorer, USB external hard drive enclosures, external hard drives and local backup to ensure proper backup for your data. No matter if you are using Windows, Mac or Linux, ASUSTOR provides the proper tools for your backup needs. MyArchive cold backup technology turns NAS hard disks into removable storage archives. Directly insert a MyArchive hard disk into the NAS to easily access, backup and share terabytes of content. ASUSTOR NAS allows you to enjoy thrilling digital entertainment at any time. Via the built-in HDMI port and various multimedia Apps the NAS can be connected directly to ultra high resolution 4K TVs and players. 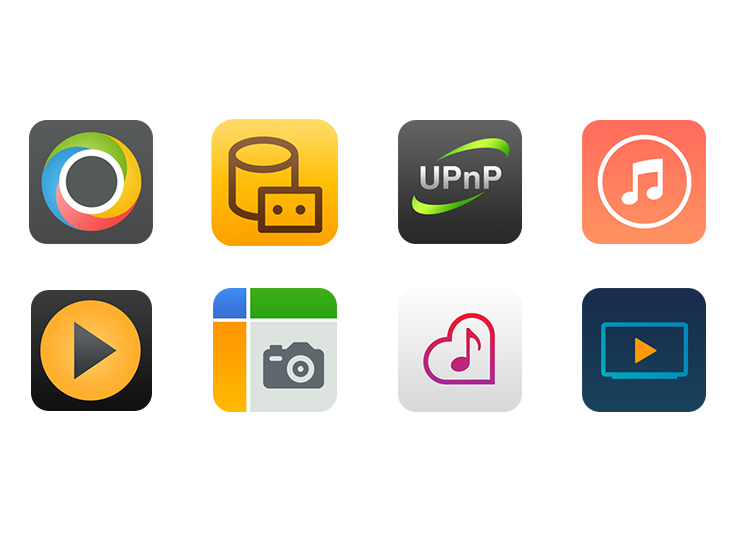 Enjoy multimedia with family and friends or use the UPnP multimedia server to stream your favorite media to compatible computers and mobile devices.